So you think you can dodge bullets? Dark Nebula by 1337 Game Design is one of the sickest most innovative Physics based iPhone games of the year so far. Along with heart pounding, intense, addictive, exciting, fun and joyous gameplay you also get some seriously amazing graphics and an eerie SciFi soundtrack that make Dark Nebula a true blockbuster of a game. If you enjoyed playing the amazing game of Labyrinth 2, you’ll be almost twice as much impressed with Dark Nebula. The game is broken down into 10 levels of increasing difficulty where you roll a futuristic looking ball along a space station like path, avoiding a wide array of obstacles, and collecting bonuses. 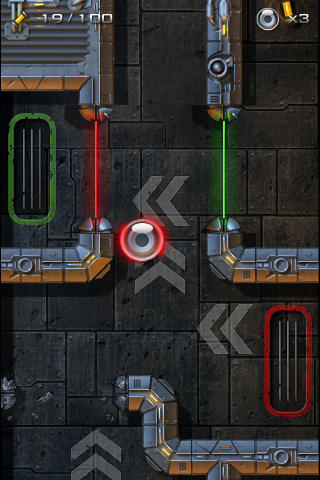 The game is played in portrait mode as you tilt your iPhone or iPod touch slightly forward to drive and maneuver your ball along the level’s route, with a handful of checkpoints along the way. The path you are rolling on is given a very realistic robotic 3D effect as it is basically hovering like a bridge over the space station which is filled with lights and robot parts. Your viewpoint is from the top down in Dark Nebula. As you hit the jump ramps you’re catapulted high into the air, and if you die, you’ll fall way down into the pits of the futuristic city. The spacial design, controls, sound effects and movements feel in perfect harmony which makes playing the game such a joy. Do good and you’ll earn extra lives and praise as well. Do really well and you’ll get awarded, bronze, silver and gold stars, which you can use to rank up your score in the online leaderboards. If you’re good enough to finish all 10 levels, including the insanely complicated 10th level, rightly called “The Motherboard”, you can then try to play them again in expert mode. You’ll have to think fast, plan your moves, follow your instincts, and even get creative to survive. Overall, we can’t say enough good things about this game. You’ll have a blast, and you don’t even have to touch the screen to play. Dark Nebula, Episode One, is one of those games that you really must have on your iPhone, without a doubt. And if the name has any significance, we can’t wait to see what the next episode has in store. AppSafari review of Dark Nebula was written by Joe Seifi on January 29th, 2010 and categorized under App Store, Featured, Fun, Games. Page viewed 4799 times, 1 so far today. Need help on using these apps? Please read the Help Page.